T. Persson, A piecewise hyperbolic map with absolutely continuous invariant measure, Dynamical Systems, 21:3 (2006), 363–378. T. Persson, Approximation and Asymptotics of Dimension for some Non-Uniformly Hyperbolic Interval Maps with Holes, Nonlinearity 20 (2007), 2615–2632. T. Persson, Absolutely continuous invariant measures for some piecewise hyperbolic affine maps, Ergodic Theory and Dynamical Systems 28:1 (2008), 211–228. T. Persson, J. Schmeling, Dyadic Diophantine Approximation and Katok's Horseshoe Approximation, Acta Arithmetica 132 (2008), 205–230. T. Persson, On Random Bernoulli Convolutions, Dynamical Systems, 25:2 (2010), 203–213. T. Persson, On the Hausdorff Dimension of Piecewise Hyperbolic Attractors, Fundamenta Mathematicæ 207 (2010), 255–272. D. Färm, T. Persson, J. Schmeling, Dimension of Countable Intersections of Some Sets Arising in Expansions in Non-Integer Bases, Fundamenta Mathematicæ 209 (2010), 157–176. H. Lundstedt, T. Persson, Modelling Solar Cycle Length Based on Poincaré Maps for Lorenz-type Equations, Annales Geophysicæ, volume 28, number 4, 993–1002. B. Bárány, T. Persson, The absolute continuity of the invariant measure of random iterated function systems with overlaps, Fundamenta Mathematicæ, 210 (2010), 47–62. D. Färm, T. Persson, Large intersection classes on fractals, Nonlinearity 24 (2011), 1291–1309. M. Nicol, T. Persson, Smooth Livšic regularity for piecewise expanding maps, Proceedings of the American Mathematical Society, 140 (2012), 905–914. D. Färm, T. Persson, Dimension and measure of baker-like skew-products of β-transformations, Discrete and Continuous Dynamical Systems series A 32:10 (2012), 3525–3537. T. Persson, S. D. Silvestrov, Commuting operators for representations of commutation relations defined by dynamical systems, Numerical Functional Analysis and Optimization, Volume 33 (2012), Issue 7–9, 1126–1165. N. Haydn, M. Nicol, T. Persson, S. Vaienti, A note on Borel–Cantelli lemmas for non-uniformly hyperbolic dynamical systems, Ergodic Theory and Dynamical Systems 33 (2013), 2, 475–498. T. Persson, H. Reeve, On the diophantine properties of λ-expansions, Mathematika, volume 59 (2013), issue 1, 65–86. D. Färm, T. Persson, Non-typical points for β-shifts, Bulletin of the Polish Academy of Sciences 61 (2013), volume 2, 123–132. B. Li, T. Persson, B. Wang, J. Wu, Diophantine approximation of the orbit of 1 in the dynamical system of beta expansions, Mathematische Zeitshrift, April 2014, Volume 276, Issue 3–4, 799–827. T. Persson, A Note on Random Coverings of Tori, Bulletin of the London Mathematical Society, 2015, 47 (1), 7–12. H. Lundstedt, T. Persson, V. Andersson, Extreme Solar Storm of May 1921: Observations and a Complex Topological Model, Annales Geophysicæ, 33, 109–116, 2015. M. Aspenberg, F. Ekström, T. Persson, J. Schmeling, On the asymptotics of the scenery flow, Discrete and Continuous Dynamical Systems A, July 2015, volume 35, issue 7, 2797–2815. T. Persson, H. Reeve, A Frostman type lemma for sets with large intersections, and an application to Diophantine approximation, Proceedings of the Edinburgh Mathematical Society, Volume 58, Issue 02, June 2015, 521–542. F. Ekström, T. Persson, J. Schmeling, On the Fourier dimension and a modification, Journal of Fractal Geometry, Volume 2, Issue 3, 2015, 309–337. T. Kempton, T. Persson, Bernoulli Convolutions and 1D Dynamics, Nonlinearity 28 (2015), 3921–3934. T. Persson, M. Rams, On Shrinking Targets for Piecewise Expanding Interval Maps, Ergodic Theory and Dynamical Systems, Volume 37, Issue 2, April 2017, 646–663. T. Persson, Typical points and families of expanding interval mappings, Discrete and Continuous Dynamical Systems A, Volume 37, Issue 7, July 2017, 4019–4034. F. Ekström, T. Persson, Hausdorff dimension of random limsup sets, Journal of the London Mathematical Society, Volume 98, Issue 3, December 2018, 661–686. 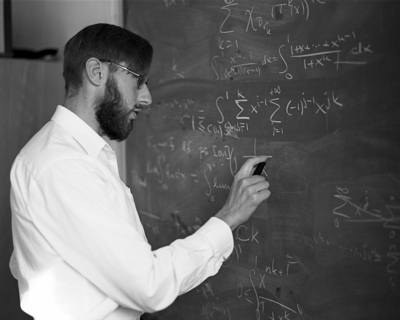 M. Aspenberg, T. Persson, Shrinking targets in parametrised families, Mathematical Proceedings of the Cambridge Philosophical Society, Volume 166, Issue 2, March 2019, 265–295. S. Akiyama, D.-J. Feng, T. Kempton, T. Persson, On the Hausdorff Dimension of Bernoulli Convolutions, accepted for publication in International Mathematics Research Notices. T. Persson, Inhomogeneous potentials, Hausdorff dimension and shrinking targets, accepted for publication in Annales Henri Lebesgue. S. Galatolo, M. Holland, T. Persson, Y. Zhang, Birkhoff sums of infinite observables and anomalous time-scaling of extreme events in infinite systems, 2018. M. Kirsebom, Ph. Kunde, T. Persson, Shrinking targets and eventually always hitting points for interval maps, 2019. T. Persson, Another Proof of a Lemma by L. Shepp, 2014. T. Persson, On a problem by R. Salem concerning Minkowski's question mark function, 2015. T. Persson, Dimension of limsup-sets of random covers, Oberwolfach reports, Volume 11, Issue 4, 2014, 2587–2590.